From left to right, Jiling Song, Zhansui Wang and Xia Wang. Xiao Wang in Livemore is hoping to bring attention to the torture her family experience in China. Xiao Wang, 37, has been waging a war at the Livermore library to gain awareness for the persecution of her family and others like them who practice the illegal practice of Falun Gong in China. The exhibit, which ends Friday, displays art created by followers of Falun Gong, a practice that combines physical exercise with meditation, an act banned by the Chinese government in 1999. It is the violation of this ban that led to the arrest and torture of Wang’s mother, father and younger brother. “I have learned many Falun Gong practitioners are tortured and suffer severe mistreatment in detention centers, labor camps, and jail, which makes me worry about their safety very much,” Wang said Friday in a phone interview. Many of the artists featured in the exhibit experienced similar persecution in China and some were detained or placed in labor camps. The artists have since moved to the United States, Canada, or Europe and have joined Wang in her effort to raise awareness about the human rights issue they say can no longer be ignored. Wang feels the exhibit has been a success and has drawn much local support from people she has met. Wang, a practitioner of Falun Gong herself and a volunteer and a for the Asian Art Foundation, describes the exercise as peaceful, combining physical movements with spiritual guidance. The practice was very popular in the 1990s in China with up to 100 million followers. Wang believes it was this popularity that the Communist government viewed as a threat, leading them to ban Falun Gong nationwide in 1999 and denouncing it as harmful and dangerous. The Consulate General of the People’s Republic of China in San Francisco did not immediately reply to NBC Bay Area on Friday for comment. 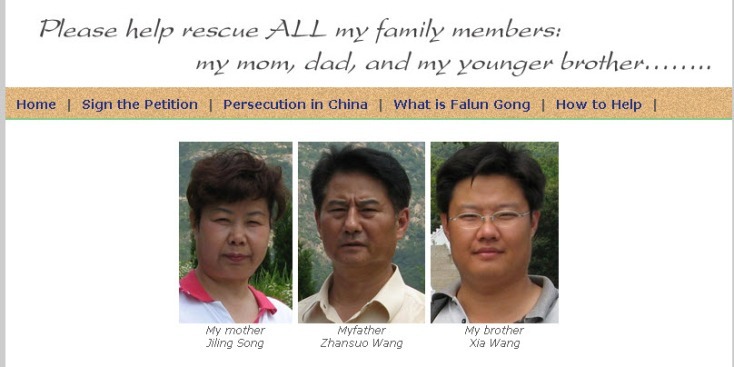 The Wang family first began practicing Falun Gong in 1998 when they saw it as a free and effective way their friends were maintaining their health. When the practice was officially banned in China in 1999, the family chose to continue practicing in private and Wang continued to follow Falun Gong from a distance when she moved to California in 2005. The family in China was able to continue secretly until 2010, when a neighbor inquired about the parents’ particularly youthful appearance. They attributed their health to Falun Gong, not knowing, she said, that this neighbor would report them to local authorities. Wang said Chinese police forces broke into their home and detained her mother, father and brother. Wang said her mother was detained and kept in an environment of high stress until she was released to a hospital due to extremely high blood pressure. She was released from the hospital two weeks later under the condition that she would remain monitored in her home for six months. Her brother was placed in a labor camp and forced to work for 37 days. Police were able to obtain a guilty plea from Wang’s father when they promised his son’s release. Though her mother and brother were freed, her father remains in prison. Wang hopes that the library exhibit in Livermore will draw attention to the suffering faced by her family and many other Falun Gong practitioners in China. She has been in contact with many government officials and representatives in hopes of freeing her father, but has not yet succeeded. Wang believes the support of government agencies and international organizations could dramatically help her efforts to free him and others imprisoned for the same reason. She continues to practice Falun Gong today.